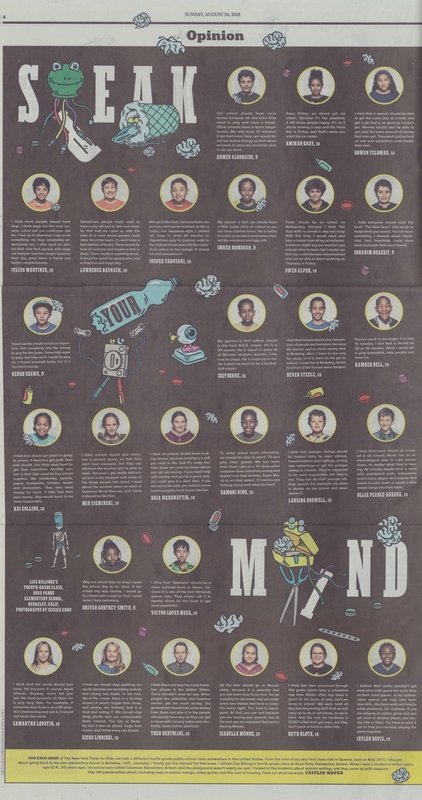 A full-page in the kids’ section of the Sunday New York Times Aug. 26, 2018 was devoted to the opinions and photos of students who were in Lisa Billing’s fourth grade class at Rosa Parks this past June. You can read the students’ ideas on banning trans fats, paying kids to go to school and a host of other topics, such as longer recess, affordable housing and eradication of parent anger over video games. The Sunday Times has a circulation of 1.3 million copies in the U.S. and Canada. Caitlin Roper, an Editorial Director at the Times, visited the classroom, talked to students about how to write their opinions and then used selections from their resulting opinion articles for the paper. Roper, who grew up in Berkeley and attended Rosa Parks (then Columbus) had been wanting to feature the school ever since she started the special New York Times for Kids section last year. She picks one fourth-grade class from across the U.S. for each issue. The kids’ section appears once a month and only in print so that’s why we’ve posted the image above.